The Reward Points module allows you to create a unique loyalty program in your store. Customers can earn reward points for orders in your store and then spend them on new orders. Customers can refer friends and receive points for friend's orders. Customers can earn points for certain actions (e.g. reviews, likes in social media, sign up for newsletter, etc). The extension will easily help you to convert your visitors into loyal and profitable customers who will become your brand advocates in a short period of time. This will, in turn, bring you more and more potential customers. This allows to receive points for certain products. On the product page, customers can see the number of points which they will earn if they buy this product. This allows to receive points for the total sum in your cart. You can give a different number of points for achieving certain conditions. Buy N products from category A and receive double the points! Pay via payment system A and recieve X points as a bonus! If customer has not visited the store for N days, the extension automatically gives X points and sends an email with an invite to use points. When customer N invites friends who place at least one order each, the customer receives a bonus of X% from the sum of their orders. Invite a friend and receive a 15% bonus for their first order, 10% for the second order, and 5% for the third order! This allows you to manage how customers can spend their points. For example, for every 10 points we give a discount of $1. It the ability to limit the number of points which the customer can use per order. For example, using points a customer can pay no more 20% of the total order. You can setup different conditions to show the messages. 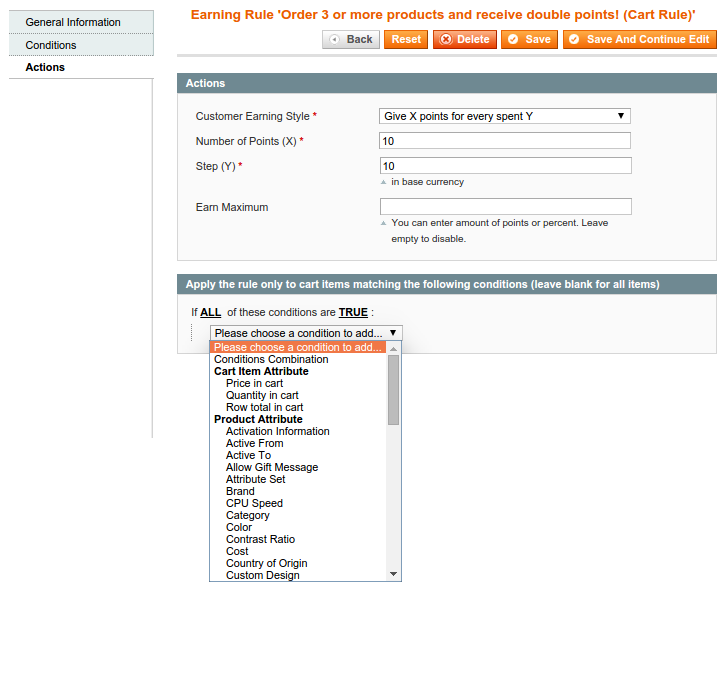 On the product page we show the number of points which the customer can earn if they buy a certain product. 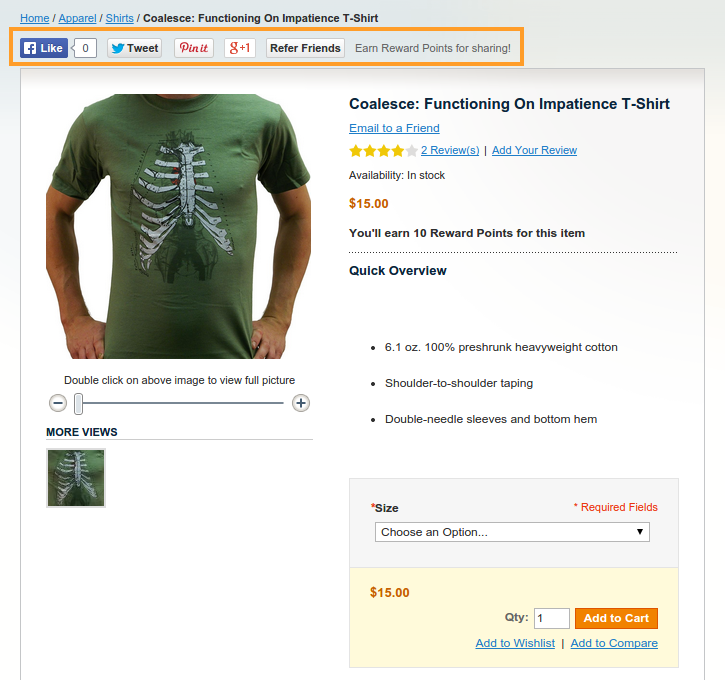 Extension displays social buttons block on the product and category pages. The customer can like the page and earn points. On the cart page we show the block, Use Reward Points. Customer can enter any number of points which they would like to spend and receive a discount. The sum of the earned and spent points will be shown in the cart total. Customer can check the number of points on their balance, their transactions, and information about conditions to earn/spend points. Customers can send invitations to their friends and earn points for their registrations or orders. 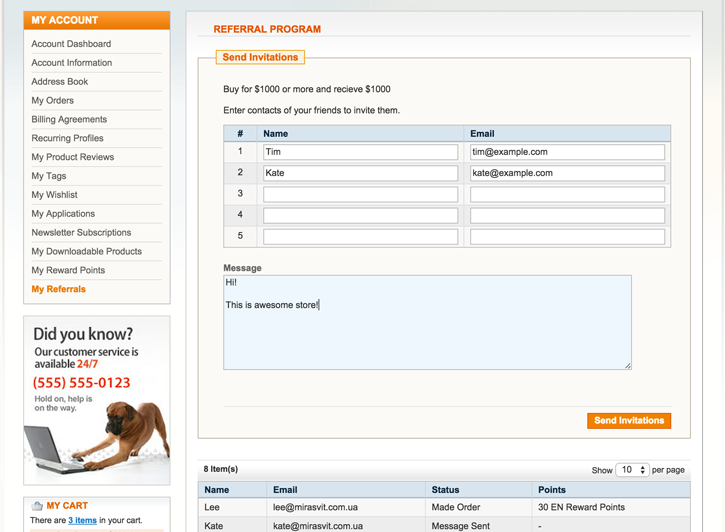 This integration allows customers to earn points for newsletter signups. 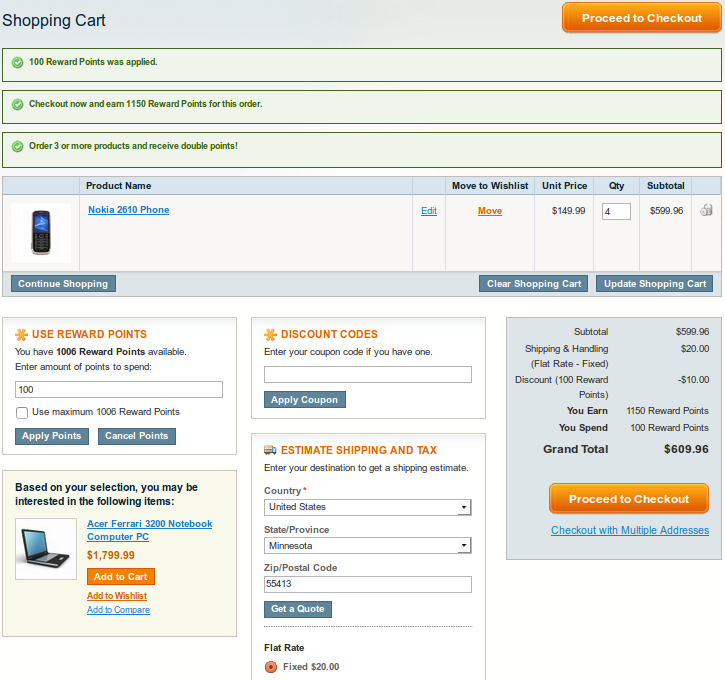 This integration allows customer to use points on the onepage checkout page. You pay for the extension only once. No monthly or annual payments. No limits for number of transactions, products or customers. Extension is integrated with Onepage Checkout extensions of different vendors. 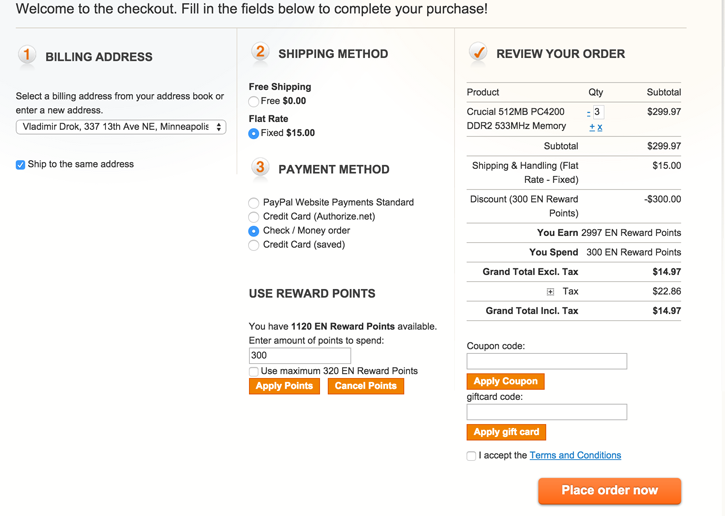 This allows your customers to spend points on the checkout page. This is very convenient for customers. Other solutions don't have this advantage. Extension has very flexible Earning/Spending/Notification Rules. This allows you to configure the extension according to your own unique requirements. We use this to get customers coming back and back. i ve bought 2 extension from mirasvit rewards poins and Rma and both extension works great. They offer good support for each problem appeared. I will sure buy from them again. Great support and great reward points extension! Highly recommend this extension, the support help me to implement on IWD checkout. Excellent Plugin for reward points works great!! Its an excellent plugin with all possible features you may need. Customer support received was really prompt and would recommend them as this is a big missing link with many development companies. A must-have system for the store owners who want to keep their customers coming back again and again. Numerous earning rules, like having birthday or being not active for a long time, is a strong advantage. Probably more earning rules should be added in the future, like filling up customer account info, or replying to a product question. But in general, the extension is what I've been looking for. A loyalty program is a great way to gain loyal customers that comes back and send more money. Mirasvit Reward Points + Referral program solves this in a great way. Really felxible setup of points and triggers. Truly recommended! This team is really wonderfull, they always help if there is any issue within short time. This extension was easily installed and works great. It has really improved our sales! Highly recommend this extension. I have a complicated theme, and the support team figured out the problems I was having. I ended up ditching the complicated theme and this extension went into the replacement theme without a hitch. Extension is what i need. Fast support no errors.. This module does exactly what is should do. We use it primarily for the direct reward system. Allows me the flexibility in running promotions for customers to earn rewards points. Good extension work as expected. 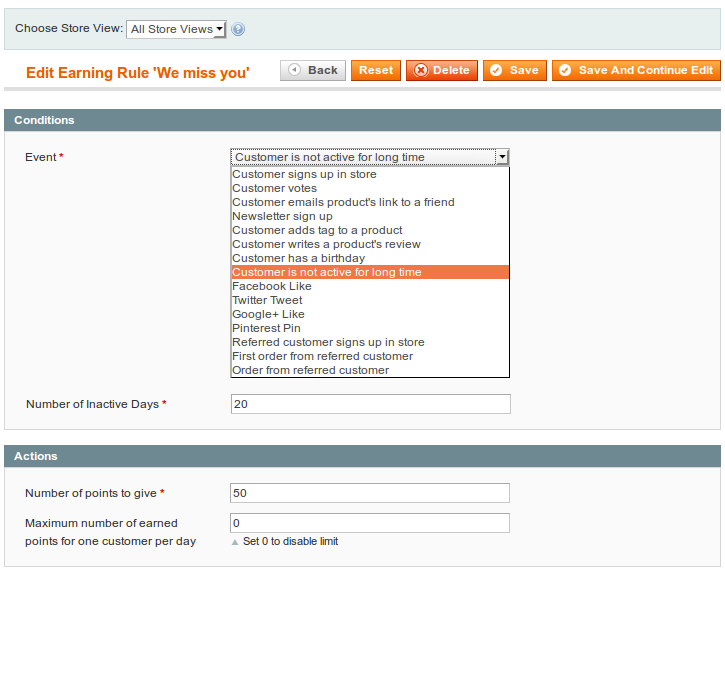 Only small point, it will be nice to have the feature to apply Reward Points while creating a manual order in the admin. Lots of possibilities, you can configure this extension in every possible way and the customers are going to be happy! This extension is super, all is valid and great support. The last month we were busy implementing this extension on our website. We encountered some extension we use and Mirasvit helped us out professionally. This is the third Mirasvit extension we use so that must tell you something about the quality and support. A great module to build and manage your affiliate portfolio. With a well thought out policy enables customer loyalty. Another worth while purchase and already seen our return on investment in under a day for this extension. I saulte you all at Mirasvit. 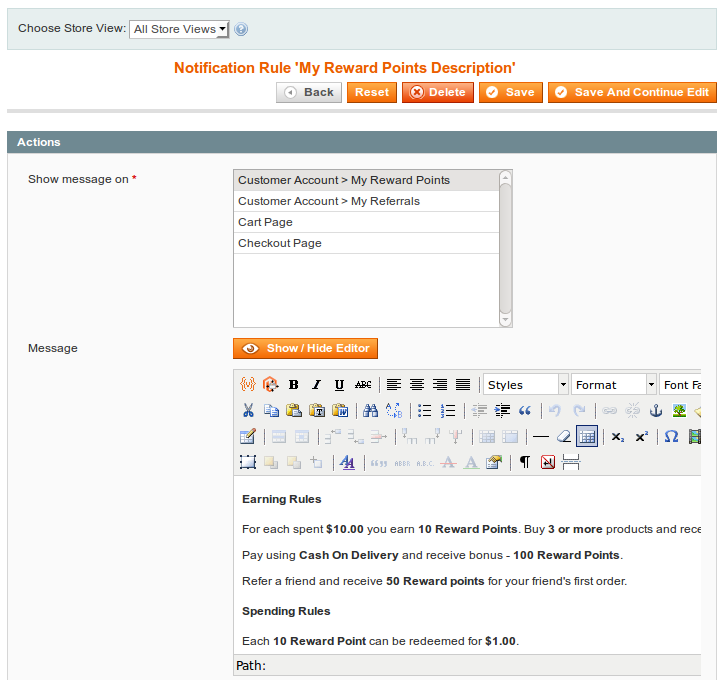 this reward point module is very useful and works very well with out custom magento site. Mirasvit guys have supported us well on this module and even they provided custom integration with magegiant module for us. so far its going on very well and we also have proposed some new features in referral program of this module. We are using most of it as of now. The refferal system is amazing, investing in exist customers is 1 of the best thing, and that thanks the plugin of mirasvit! Thanks Mirasvit from the Netherlands! Very powerful reward program that allows you to set spending and shipping rules based on condition and behaviors. The ability to give reward based on social sharing is a huge plus. We had some compatibility issue with in-store credit extension. Support team was able to resolve the issue. Highly recommend both the extension and Mirasvit. I use the extension combined with reward data from a physical shop. also the support is great! I would recommend this extension if you want to provide your loyal customers. Had few questions about license for dev. domain. Support responded quickly and helped solve problems I had within 5 mins. The extension is great. Excessive features and great price. Support is outstanding, the guys answer almost immediately and solve problems within hours + enhancing features in really short time on request. I can recommend this extension and mirasvit in general. The Rewards Plugin by Mirasvit is definitely comparable with the features it provides with respect to other rewards plugins and the price is very competitive. The install and setup service was simple and I had some CSS issues with my theme that Mirasvit support looked into and fixed without any issues. Support replies were always timely and I look forward to doing business with this extension provider in the future. Great service! Very fast and i would defiantly buy more extensions from Mirasvit.